New for 2019! A modern take on a classic sound from the cymbalsmiths at Meinl. Each Foundry Reserve cymbal is its own unique, hand-crafted instrument, and yours may vary in appearance from the one pictured here. Payments as low as $35/mo. Once again, Meinl has revolutionized its groundbreaking Byzance family of cymbals by introducing a new and exciting tonal palette. The Foundry Reserve line of cymbals offers a classy and refined sound for the drummer looking for a new level of complexity and dimensionality from their bronze. Each hand-crafted, hand-hammered cymbal features its own subtly unique appearance and sonic character. These cymbals feature a lathed top and bottom in a traditional finish, lending to a stick attack that is as articulate as it is delicate. Extensive hammering marks introduce dark undertones that respond extremely well to dynamic playing. The overall result is a warm and dark sound that is perfectly suited for classic and modern styles alike. Each cymbal ships with a pair of commemorative gloves, a pair of Meinl’s new drum sticks, and a certificate of authenticity. 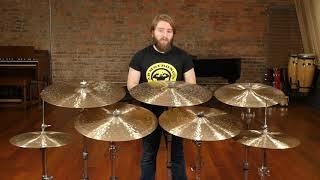 In this video, Sound Pure drums and percussion specialist Paul Spencer runs us through Meinl's fantastic new Byzance Foundry Reserve line of cymbals. The NEW Byzance Foundry Reserve collection is a limited selection of cymbals that showcases the stunning, sonically rich works of art that our cymbalsmiths create with layers of tonality and nuance; however, that is only half of the beauty, as they are visually striking from the one-of-a-kind hand-hammered marks. The extra hammering creates many deep craters across the surface. When this hammering is coupled with the fully lathed top and bottom, it produces a clear, dry stick-attack note over a lush bed of low undertones – otherwise known as "the roar." 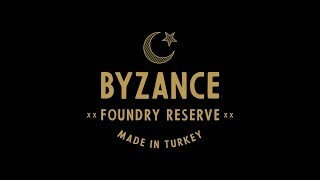 The Byzance Foundry Reserve crash is unique when compared to our other 18“ Byzance crashes. It features a very dark and explosive response that quickly decays and, additionally, it can be used as a light ride cymbal for drummers looking to maximize a minimal cymbal set. This comes from the combination of extensive hand-hammering in addition tot he fully lathed surface. The medium weight gives the crash a full-bodied sound at its apex. Only MEINL uses 6 different alloys for crafting cymbals, which is more than any other cymbal maker is using today. Because of that, we are able to offer the widest selection of basic cymbal sound characteristics available. Striving for the realization of any possible sound idea makes it necessary to have this diversity, the background in and knowledge of all those different materials. Constantly trained and highly qualified employees master all challenges within our production team. Most of them are drummers themselves! And if someone is not and starts working for us, we pay for the drum lessons. They know why they are doing what they do, and don’t consider it just another 9 to 5 job. It’s that dedication which makes the difference you can hear!